Elastic strap used for training of moving pitches. Hang across the zone to watch the drop fall off the table, put it higher to measure the riseball, or hang from the top of the cage for the curve or screwball. 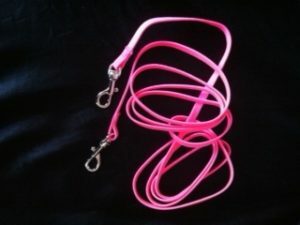 This 10-foot elastic strap is designed with features we need: high-visibility pink color to give maximum feedback; loose stretch to move easily out of the way lessening the chance of ball deflection; and, hook-clip ends to easily attach to almost anything from the cage netting to a folding chair, batting-T or whatever you have on hand.